Sauerkraut is essentially fermented cabbage. During the fermentation process, beneficial probiotics, or ‘live bacteria’, are produced, and these probiotics are what give sauerkraut most of its health benefits. Sauerkraut is a good form of dietary fibre and contains vitamins C and K, potassium, calcium and phosphorus. – Contributes to Stronger Bones. One serving of Sauerkraut you have a similar amount of probiotics that you have in a capsule of Probiotics. Even taking in a few tablespoons of the juice is great to quiet and upset stomach. Is canned or cooked Sauerkraut good for you? 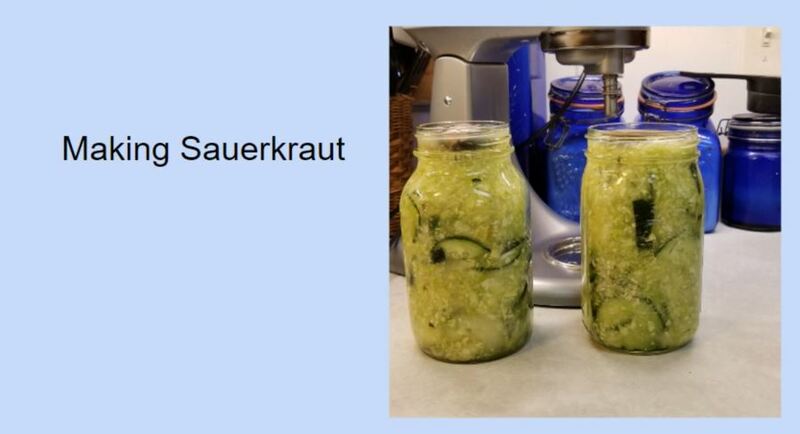 Most canned sauerkraut has been pasteurized, which kills off the good bacteria. It is best to purchase fresh sauerkraut (made without vinegar) to reap all the health benefits. The cooked sauerkraut is still a healthy vegetable. Using stones to hold down the kraut is an idea I have wanted to use for a long time. It seemed to work quite nicely. I’m not sure I have ever seen it done that way. When I was a kid at home my Mom would use a plate on top of a crock with a rock to hold the plate down in the Kraut. As the Cabbage ferments, it makes bubbles and the liquid comes up and out of the jar. That is why you don’t want your jars to have a complete seal, it allows the fermentation process to take place. You do however want to have a way to keep debris and bugs from getting in the kraut as it is fermenting. We placed a canning lid on the jars loosely. I hope this info has been helpful to you. We look forward to hearing from you. Leave us your comments. Until next time – Be Well!